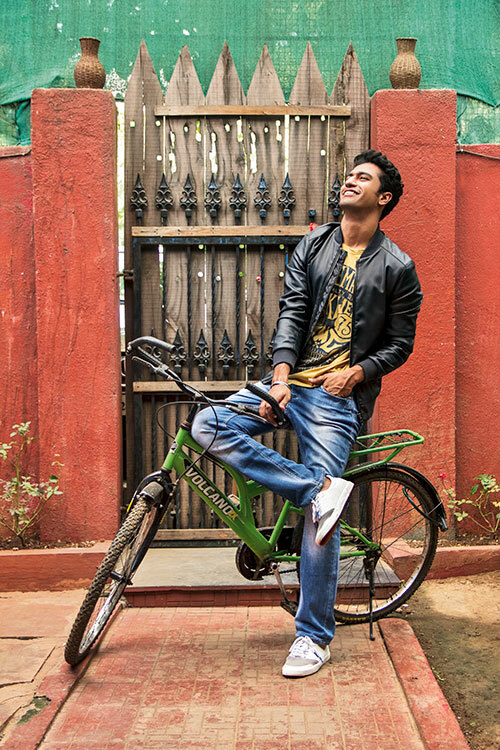 We saw him as the innocent boy from Varanasi in Masaan and, now, we see him dressed casually in jeans and a T-shirt. Vicky Kaushal, the 27-year-old who made waves with his first appearance on the silver screen, has even received a compliment for his performance from the shahenshah of Bollywood, Amitabh Bachchan. An introvert by nature, he says “I was quite shy as a child, but I always found my voice on stage; I felt liberated there and followed that sense of freedom throughout my adolescence”. An engineer by education, Vicky stepped into acting when he realised that he couldn’t live a regimented life. Driven to be like his father (action director Sham Kaushal) — self-made, fearless and strong — the former assistant director (Gangs of Wasseypur) admires the styles of Ranveer Singh and Anil Kapoor. “They can carry off ensembles from subtle to flamboyant with equal ease and panache,” he explains. An artiste who aims to be honest to every character and script, Vicky thinks dressing up — or down — is something one shouldn’t ignore. “If you feel like a million dollars, you’ll look like it too,” he says. Impatiently awaiting his next release Zubaan later this year, this optimist believes in taking life one step at a time.